DJ Service for weddings, Dances, and all other types of parties. The Best DJ Service in Dayton. Our Wedding DJ service is the top choice you can make for your wedding reception entertainment! Give 937-421-1492 a call if you're looking to get your party poppin, our DJ's are up to the challenge. Our DJ's not only spin your favorite tunes to groove to, they also preside over the event as the master of ceremonies. They’ll introduce the bride and groom, take care of releasing tables to the buffet, getting the dollar dance cranked up, and any other moment you want to capture during your reception. Before your wedding, we’ll sit down and make sure we understand your expectations so we can prepare to blow them out of the water. 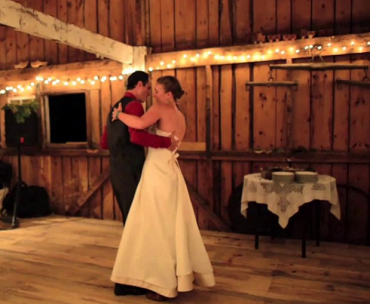 The best compliment paid to us is knowing the bride and groom aren’t stressing about their DJ. Our libraries are overflowing with tracks from pretty much every genre. Love Motown? We got you. Love the 70’s? We got you. Love a little old school hip-hop? We got you. Bon Jovi? You’re on your own there. Just kidding. We’ll blend all these together to make sure everyone’s’ feet hit the dance floor. No need to peruse theknot.com, weddingwire.com, or thumbtack.com for reviews on finding the best DJ in Dayton at the best price. 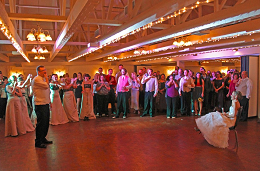 You won't find a better value in Dayton, Cincinnati, or Columbus for your wedding DJ. We’ll make sure your reception is one to remember… the night is designed with you in mind. Here's what else we have to offer on top of being your Wedding day DJ and MC. If you don't yet have an organist, we can provide the wedding ceremony music. 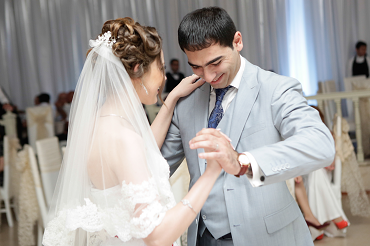 Our DJ's are trained to perform all different types of music for your wedding ceremony. If you'd like, we can light up your reception to your liking. 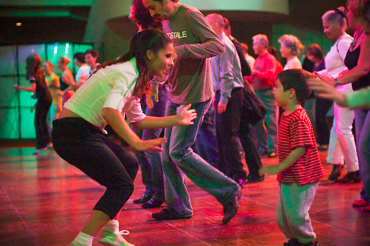 We can hang a disco ball for the slow dances and accentuate the dance floor with colorful stage lighting when it's time to get people on their feet. 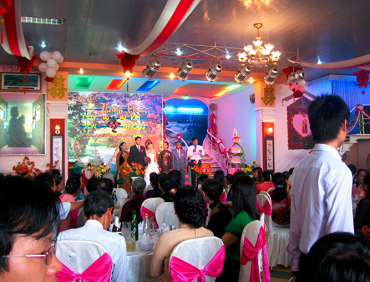 Want karaoke at your reception? No problem! We have DJ's that specialize in karaoke too! Have a friend that thinks she's the next Taylor Swift? Let her do her thing! 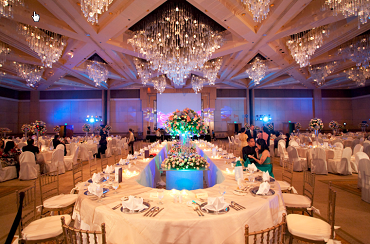 Do you expect more than 180-200 guests for your wedding reception? We have additional premium speakers to accommodate the larger reception halls. We'll make sure the sound is tuned perfectly for the venue prior to the reception. A must for any DJ anymore are wireless microphones. We've got em too. Especially perfect for the best man and maid of honor speeches. Why Choose the Finest DJs in Dayton? Our experienced DJ’s will bring class and elegance you expect with top shelf service to you and your guests. When it’s time to turn the buffet line into the dance floor, we have more lights and speakers than anyone in Dayton. It’ll look like a Bruno Mars concert showed up. Julio- get the stretch! We’ve MC’d events in pretty much every venue in Dayton. Whether your event is at the Schuster Center, Dayton Art Institute, Cox Arboretum, or any other venue of choice, we’ll make sure we maximize the space for the best light and sound imaginable. We'll travel to Englewood, Trotwood, Huber Heights, Fairborn, Beavercreek, downtown Dayton, Centerville, Moraine, Miamisburg, Oakwood, Kettering, Bellbrook, Springboro, Tipp City, and Troy. So, I’m sure it’s crossed your mind. Why not use the sweet little phone in my pocket as a music playlist and have a good friend DJ the event? You can, nothing wrong with that. However, you’d be missing out on an incredible experience. Nothing can replace the goose bumps you get when you walk into a venue that is lit to perfection and sounds amazing. As part of our initial consultations, we’ll walk thru your venue of choice and recommend the best layout for light and sound…. But ultimately, the choice is yours. Let us help you have the best time at your event. Dayton's Wedding DJ would love the opportunity to meet you and chat about what you’re looking for and how we can help get you there. Contact us today! We can DJ your Prom/ Homecoming Dance, Sweet Sixteen, Corporate Event, Block Party, or Family Reunion too. 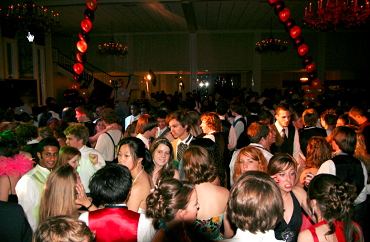 Are you or is your school looking for an DJfor this year’s Homecoming and Prom dances? If so, please look no further. 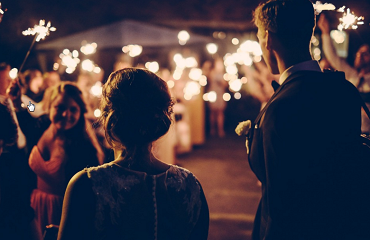 Much like our wedding DJ package, we will MC the entire event. We’ll introduce the court, crown the king and queen, and get the dance going. We’ll chat with the appropriate school representatives ahead of time to get an idea of what the expectations are for music and festivities. Is your 16th birthday coming up? Do you have a big party planned for it? 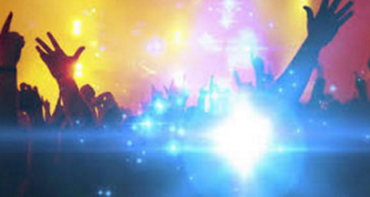 Why not crank it up a notch with the best DJs in Dayton, Ohio? Your birthday will be unforgettable with the help of the best mix of music tailored for you and your crew. We’ll make sure you’re taken care of like the princess you are. Does your company have a big event in its future? Celebrating a significant anniversary? Have an important open house? Does your national sales meeting need more life? Big product launch in your future? Our DJ's will provide the pop the events typically lack with our audio and lights. Whether you’re planning a more formal event or something a bit more laid back, we’ll tailor our services to meet your needs. Do you live in a neighborhood where everyone gets along really well? Have you thought about having a block party but have never pulled the trigger? It’s time to do it… and leave the DJ-ing to us. Block parties are simply a fantastic way to connect with and get to know your neighbors a lot better than you do today. Are you one of 35 cousins? Do you all get together once every 2 or 3 years? Is it boring? 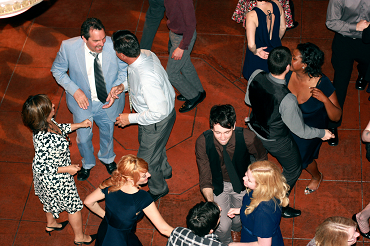 Breathe life back into your reunions by adding lights and sound with our best of class DJ service. Nothing brings a family together like busting a gut at uncle Larry working his electric slide and watching the sugar fueled kids run around and have an absolute blast. Looking to get out of that New Year's Eve rut where you end up asleep by 10:30, only to be awoken by neighborhood revelers at 12:01? Kick the habit by calling Dayton's Wedding DJ at 937-421-1492! We'll add some kick back to the biggest party night of the year.